Take your shuffleboard game to the next level! Sharpen your skills and elevate your game with this unique, new approach to table shuffleboard! Compete against family, friends and opponents on any size table! Shuffleboard Challenge provides real practice drills in a simulated game format and offers a fun, alternative game to play on your shuffleboard. Each deck has 52 cards. Each card is a "challenge" that is worth different point values based on difficulty. The game is for 2 - 4 players. Start improving your game now! 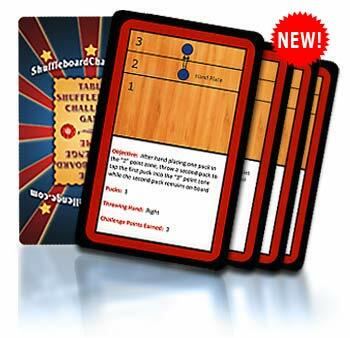 Order your set of Shuffleboard Challenge cards and impress your friends with your newfound skills. 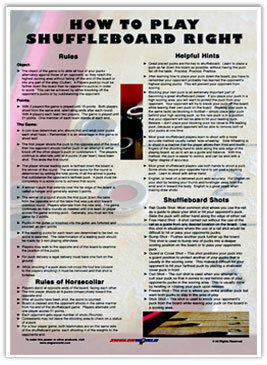 Our Play Shuffleboard Right 11 x 17 Poster contains the Basic Rules of Shuffleboard along with the Rules for Horsecollar. Included in our poster is a Helpful Hints Section to take your game to the next level along with descriptions of different types of Shuffleboard Shots. This Poster would look Great in any Game Room, Bar or Club. Website price - $19.99 with FREE Shipping!